Triatoma rubrovaria has become the most frequently captured triatomine species since the control of T. infestans in the state of Rio Grande do Sul (RS), Brazil. 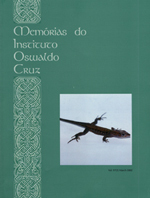 The aim of this study was to evaluate aspects of the vectorial competence of T. rubrovaria using nymphs raised in laboratory under environmental conditions of temperature and humidity and fed on mice. The average developmental period of T. rubrovaria was 180.1 days. The percentage of defecation shortly after feeding was still higher than previous studies in which samples of T. rubrovaria subjected to a slight starvation period before the blood meal were used. The obtained results support former indication that T. rubrovaria presents bionomic characteristics propitious to be a good vector of Trypanosoma cruzi to man. Therefore its domiciliary invasion process must be continuously monitored.